This finding of an alternative biochemistry makeup will alter biology textbooks and expand the scope of the search for life beyond Earth, NASA suggested. "Biological dependence on the six major nutrient elements carbon, hydrogen, nitrogen, oxygen, sulfur, and phosphorus is complemented by a selected array of other elements, usually metal(loid)s present in trace quantities that serve critical cellular functions, such as enzyme co-factors. There are many cases of these trace elements substituting for one another," says the study. "However, there are no prior reports of substitutions for any of the six major elements essential for life. Here we present evidence that arsenic can substitute for phosphorus in the biomolecules of a naturally-occurring bacterium." 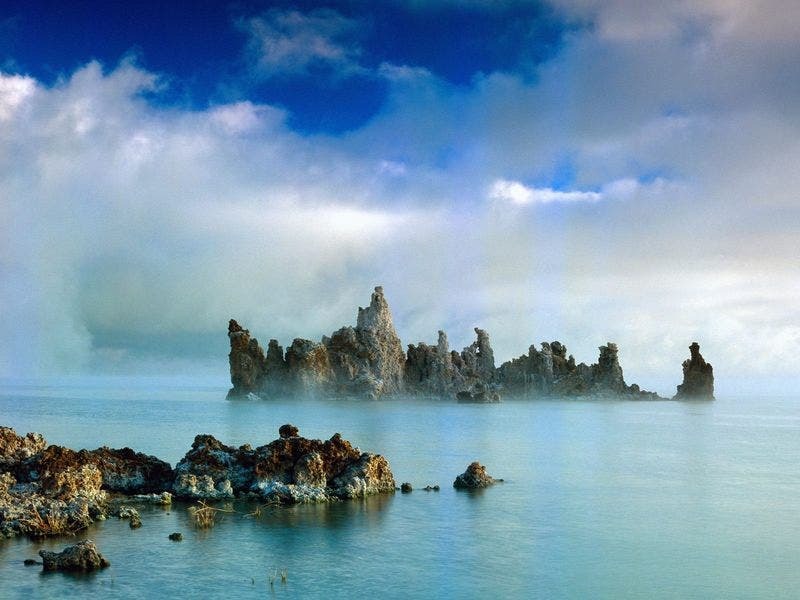 The NASA scientists trained a bacterium taken from the bottom of Mono Lake in California to eat and grow on a diet of arsenic, in place of phosphorus — one of six elements considered essential for life — opening up the possibility that organisms could exist elsewhere in the universe (or even on Earth) using unknown alien biochemical powers. The bacterium, grown for months in a lab mixture containing arsenic, gradually replaced atoms of phosphorus as its energy source for atoms of arsenic. Phosphorus is one of six chemical elements that have long been thought to be essential for all life on Earth until now. Phosphorus chains are the backbone building block of DNA and its chemical bonds, particularly in a molecule known as adenosine triphosphate, the principal means by which biological creatures store energy. While nature has been able to engineer substitutes for some of the other elements that exist in trace amounts for specialized purposes — like iron to carry oxygen — until now, reported The New York Times "there has been no substitute for the basic six elements. Now, scientists say, these results will stimulate a lot of work on what other chemical replacements might be possible. The most fabled, much loved by science fiction authors but not ever established, is the substitution of silicon for carbon." The Viking landers that failed to find life on Mars in 1976, Dr. Wolfe-Simon pointed out, were designed before the discovery the discovery of Earth's extremophiles such as tube worms and other weird life at deep undersea vents and the ancient dry valleys and buried lakes of Antarctica. On Mars, as on Earth, methane is extremely unstable because it's continually being broken up by ultraviolet rays from the Sun and chemical reactions with other gases. The average life of a methane molecule on Mars is 400 years, which means the gas must be continually replenished or it will disappear. Something is producing methane on Mars today -the big question is: What? Sergio Fonti (Universita del Salento) and Giuseppe Marzo (NASA Ames) have used observations from NASA’s Mars Global Surveyor spacecraft to track the evolution of the gas over three martian years. There is potentially a vast biosphere a few meters below Mars' surface, which the 1976 Viking mission may not have been able to access since it was only scratching the surface of the uppermost layer of soil. NASA's first press release about the Viking tests announced that the results were positive. The "labeled Release" (LR) experiments had given positive results. But after lengthy discussions in which Carl Sagan participated, NASA reversed its position, mainly because another experiment detected no organics in the soil. Soil and ice from Antarctica's Dry Valley certainly contains extreme life forms. The test for organics was negative because it is far less sensitive than the LR experiment. The same problem could have caused the organics test on to give a false negative. Corinna Wu asked: Could the oxygen that rusted the iron on have been produced biologically? Could life on Mars have simply "run out of steam" after that stage of its development? In a paper in The International Journal of Astrobiology, Felisa Wolfe-Simon and Ariel Anbar and Paul Davies, both of Arizona State University, predicted the existence of arsenic-loving life forms. According to Science, a bacterium known as strain GFAJ-1 of the Halomonadaceae family of Gammaproteobacteria, proved to grow the best of the microbes from the lake, although not without changes from their normal development. The cells grown in the arsenic came out about 60 percent larger than cells grown with phosphorus along with large, empty internal spaces. By labeling the arsenic with radioactivity, the NASA Astrobiology researchers were able to conclude that arsenic atoms had taken up position in the microbe’s DNA as well as in other molecules within it. It was inconclusive, however, that there was arsenic in the backbone of working DNA.